Four years of conflict have plunged Yemen into the world’s worst humanitarian crisis. Widespread fighting has killed thousands of innocent civilians and forced millions to flee their homes; however, it’s food that has become the deadliest weapon of war for the people of Yemen. Over eight million Yemenis do not know where their next meal will come from and 14 million people are on the brink of famine. People are already dying from malnutrition. Very little food is produced in Yemen and people depend on imports. Warring parties have intentionally blocked food, fuel and essential aid from entering the country and restrictions have been placed on private importers of food and fuel, pushing prices even higher. At the same time, the economy is collapsing, and people are losing their jobs, income and ability to provide for their families. Airstrikes and fighting across the country have wiped-out farms and factories, destroying both sources of food and people’s livelihoods. If people can no longer afford food and if life-saving aid cannot reach them, they will not survive. What can be done to help end this crisis? The people of Yemen are not starving, they are being starved. This crisis is entirely manmade and all parties to the conflict can resolve it. Our government must show leadership and use their influence within the international community to call for an end to the blockade and unimpeded access for imports of life-saving aid, including food as well as immediate and lasting peace for the people of Yemen. Our leaders have condemned the attacks on innocent Yemenis, but they need to shout louder and demand that food is no longer used as a weapon of war. With 14 million men, women and children in Yemen on the brink of famine – half the country’s population – there has never been a more urgent time to act. Will you take action now and demand that all parties to the conflict stop starving Yemen? 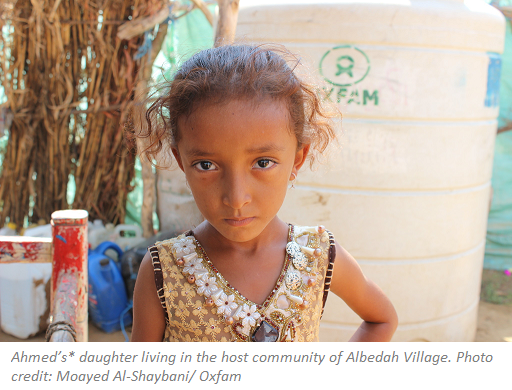 Ahmed’s* daughter, pictured, and her siblings were forced to flee their home in Yemen due to conflict. They now live with a host community in the village of Albedah, where Ahmed, who had to leave his job and steady income behind, struggles to make money to feed his family. As conflict escalates in Yemen, cholera and hunger are tightening their grip. Over eight million Yemenis don't know where their next meal is coming from and at least one million people have contracted cholera. We are stepping up our work in Yemen to help families in desperate need. Since the beginning of the conflict, our teams have reached more than three million people with much-needed clean water, cash assistance and food vouchers. By donating you'll be supporting the work done by Oxfam, and helping women, children and men facing unimaginable crisis in Yemen and around the world. Image (right): Children collect water from one of the points installed by Oxfam in the Amran governorate in Yemen.